Back to painting the cherries! 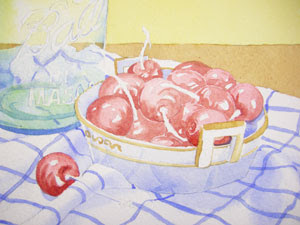 I want the cherries to look round, so I need to focus on the values, shadows, and the direction the light is coming from. I also need to be sure that I am painting the shadow SHAPES correctly. Since we are creating the illusion of a three-dimensional subject on a two dimensional surface, the sure fire way to accomplish this is by correctly using color, value and SHAPE. Again, look at the reds on your palette. You may want to add some darker browns to your choices here. 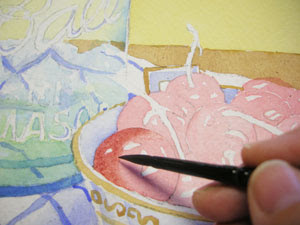 I started to use Permanent Alizarin Crimson to work in some of the shadow shapes around the cherries. Be consistent with your light source. If the light is coming from the upper right, be sure the darkest shadows appear on the lower left. Some of the cherries will cast shadows here and there on the other objects.